Featured on thewest.com.au, this image was also a finalist in the 94.5 2012 Skyworks Photography Competition. 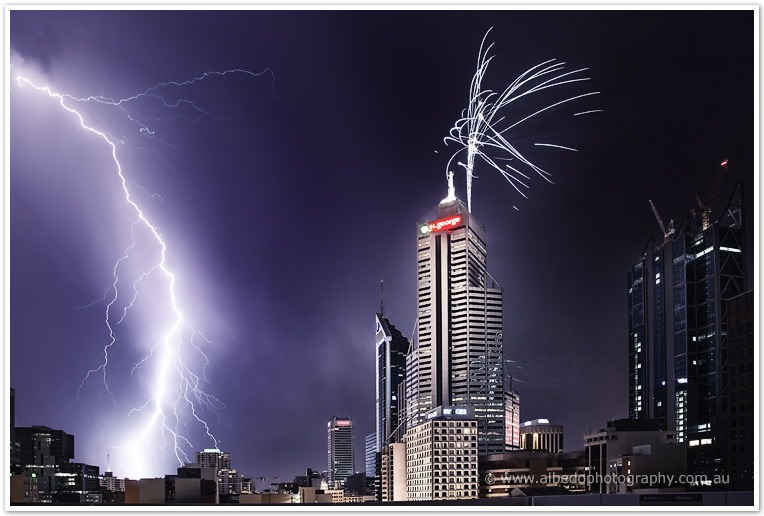 Crazy weather today for Australia Day Fireworks 2012. It was 42C in the morning, but by late afternoon dark stormy clouds began forming. We had stayed back at a friend’s BBQ a tad late so didn’t have it enough time to make it to the south side of the Swan River, but after seeing the sky we knew we had to take some photos… So we went to a car park roof top in the centre of Perth. The lighting began just before the Australia Day fireworks started, creating an amazing display natures and man’s pyrotechnics complemented each other. It was an awesome skyshow! Such an inspiring shot. I’ve always wanted to photograph lightning. To see man and nature together like this is brilliant. What a sick photo. It looks absolutely surreal. WOW. The fact that you were able to capture this is just beyond me. Awesome shot! Wow, crazy! Love the juxtaposition. Great capture. did you jump up and down and cheer when you got that shot? Because I would. Craziness. Unreal! What a moment. What a crazy contrast, gorgeous photo! A-MAZ-ING!!!! Talk about perfect timing! Great job! Wow what a shot – so surreal! That photo is amazing. What luck (haha skill?) to get fireworks and lightning at the same time! Amazing. what a great shot! incredible luck to get both at the same time! well done!